Pamplin Media Group - Should Crook County join State of Jefferson? The idea of forming a new state comprised of rural Oregon and California counties has been brewing for decades. 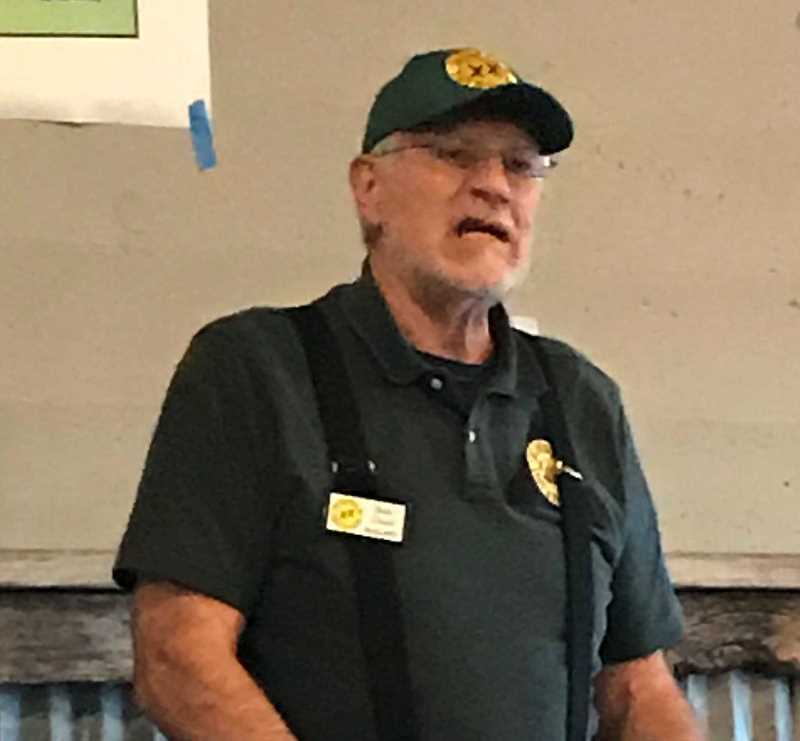 Last Friday, Bob Chard, the Oregon Coordinator for the proposed State of Jefferson, stopped by Prineville to explain the idea to interested residents and drum up support of the idea in Crook County — one of the 22 Oregon counties slated for inclusion. About 60 people gathered at Room 1868 in downtown Prineville, where Chard spent about an hour explaining the new state proposal and fielding questions from the audience. A longtime Grants Pass resident, he stressed that his home county and many others in Oregon face a lack of government representation. A displayed graphic notes that the 22 rural counties are represented by a total of eight state senators and 14 representatives whereas the other 14 counties in the northwest portion of Oregon are represented by 22 senators and 46 representatives. "I call it the non-representation banner," Chard said of the graphic, "because we definitely have a lack of representation." Chard told the audience that representation used to be different in Oregon, closely mirroring the republican structure of federal government. While House representatives were apportioned by population, as they are today, representation from the state's 30 senators came very close to representing all 36 counties equally, similar to how two U.S. senators represent each state in the nation. That changed in 1964, he said, when a U.S. Supreme Court decision determined that state senators must be apportioned by population. Chard contends that the change was not constitutional, and backed his claim by quoting Article 4, Section 4 of the U.S. Constitution: "These United States guarantees every state in the union a republican form of government." "When we form the new state, we are going to go back to the way it used to be," he said, "one state senator for every county for fair and balanced representation." The initial proposal for the State of Jefferson originated in 1935, according to Chard. He told the audience that a miner from Siskiyou County, California, and a logger from Curry County, Oregon, had gotten together and were "lamenting how their respective governments collect their taxes and they don't get anything back for it." "One of them said, 'Let's make a new state,'" he said. Just five counties were included in the original idea, four of which are in California and one — Curry County — in Oregon. "It has grown from there," Chard remarked. He went on to remark that the initial proposal managed to get a good head of steam, and organizers of the movement were about to approach their respective state governments with the idea. However, the day they chose, Dec. 8, 1941, fell one day after Pearl Harbor was attacked, so they opted to wait until a later date to move forward. Since that time, another 19 California counties and 21 Oregon counties have been added to the proposed State of Jefferson. Chard noted that the state will be "conservative and constitutionally minded" and will feature smaller government and more personal freedoms. He pointed out that Oregon has 170 state agencies and the State of Jefferson would have 50 or fewer. The state would not impose a property tax and instead would collect revenue through a flat income tax and a sales tax, the rate of which would be determined by a vote of the people. Of the tax revenue collected, 80 percent would go to the counties and 20 percent to the state government. Chard said that State of Jefferson is far from a finished product at this point. Many of the counties included in the State of Jefferson proposal are listed as "showing interest," and several other Oregon counties are categorized as having "working committees." The majority of the California counties by contrast have made declarations that they are splitting off to form a new state. Breaking into two states is not a new idea, Chard went on to note. West Virginia split away from Virginia, and Vermont, New York and Maine separated from Massachusetts. But in order to legally do it, a simple majority of both the state legislatures involved and Congress must approve the change. In addition, some of the finer details of the government structure are still undetermined. For example, one audience members asked what specific goods would fall under the proposed sales tax. Chard said that detail is not yet decided. While that is the case, literature distributed at the Friday meeting notes that many successful rural state constitutions can provide a useful template for the State of Jefferson government. "We need a state with fewer agencies, less taxes, less bureaucracy, state sovereignty and more personal freedom," the brochure states. "Please talk to your representative and ask them to support the State of Jefferson."